Searching for a job? You’ll want to put your best foot forward and hope your potential employer wants to start seeing you on a regular basis! Here are 25 helpful interview etiquette tips to keep in mind when you set off on your job-seeking journey. Do some "Sherlocking": Many companies have multiple sources of available information. Be sure to check out blogs, social media pages and stock reports. Take notes. Find ways to bring your research (being selective, of course) into the interview conversation. In this case, being a stalker is a GOOD thing! Clean up your social media: It's a good idea to comb through your social media with the eye of a potential employer. Profanity and coarse joking may give a less-than-favorable impression. Pick a good interview time: Sometimes you won’t have an option of what time to come in for an interview, but oftentimes you do. Research has shown mid-mornings on Tuesday are a good time to interview because employees have caught up on Monday and haven’t checked out like at the end of the week. Also avoid timeslots that are just before lunch (unless lunch is part of the interview process). Practice saying less: There’s the old adage, "If I had more time, I would have said less." In the business world, an "elevator speech" is when you are able to give a concise description of what you are selling. In this case you are selling you, so write down and practice ways to be concise when explaining your most important skills, strengths and ideas. Practice being nice: If you are more on the sarcastic side, you'd be surprised how quickly you can be judged by a snarky remark, even if you are just joking. Also, it's important to be kind to everyone you encounter from the parking lot until you make it back to your car afterward. You never know who could be asked for their thoughts on your conduct. Practice getting there: Internet maps are helpful to get you to the parking lot but stop being helpful when you have to find the correct building among several and search for the right suite when the hall splits into two corridors. It won't hurt to search out the interview location if you know this might be a possible scenario. Plan to get there early (10-15 minutes max) and about five minutes before your interview, let someone know you have arrived. 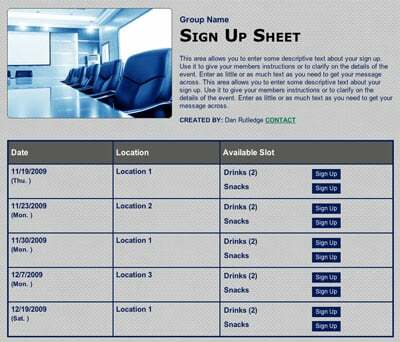 Schedule class registrations using an online sign up! SAMPLE. Be very sure to turn off your phone: And this means in the elevator getting there and in the waiting room. Tapping around on your phone never looks good in an interview setting. You're never fully dressed without a smile: A smiling face (avoiding perma-grin, of course) will make a great impression, even if you are stressed to the max. If you frown, your interviewer may be distracted and wonder the whole time what's wrong. It's never wrong to smile. Look into their eyes: Don't look above a person's head, scan their clothing or stare out the window, no matter how good the view. Eye contact is a must. Stand up and offer a handshake if a new person joins the interview and make a note of their name for later reference. Online interviews: More employers are using online interviews to save travel expenses and time. The first rule of online interview etiquette is to make sure your technology works and you can connect with the employer when the time comes. Make several practice calls to friends to check for a good connection, and when you connect for the interview, make sure they can hear and see you. Online interviews, part 2: Look at the shot you're creating on camera and make sure it's professional looking and free of background clutter. Professional dress will look great most of the time, but if your interview is for, let's say, an outdoor outfitting company, going with something more sporty (but not sloppy) may fit the bill. Also, wear nice pants and shoes in case you have to walk away to get something for the interview. You never know. A little self-awareness goes a long way: Let's be honest, "Type A" personalities tend to be bossy and driven, which can be an asset in the office but derail an interview. If you know you are this type, be extra conscious of letting the interviewer take the lead, don't interrupt them and avoid correcting them (let it go!) unless it's about your personal information. It is possible to be too laid back: Just as being bossy is an interview no-no, being too laid back and casual, rather than professional, can give the wrong impression. Using formal titles like "Mr." and "Ms." show respect, and like your mom told you, sit up straight. Good-mouth your former boss: If you have left an undesirable job, avoid the temptation to throw your boss or fellow employees under the bus. Instead, talk about how you grew from the experience and what that "difficult situation" taught you. Online interviews, part 3: Speak clearly and at medium (not low, not shouting) volume. Feel free to ask for clarification if the office atmosphere is noisy on the opposite end of the interview. Turn off other programs on your own computer and remember the importance of smiling, eye contact (not looking at yourself), sitting up and minimizing distractions are the same as a face-to-face interview. Schedule exit interviews using an online sign up! SAMPLE. Show off your problem-solving skills: Come prepared with examples of how you dealt with difficult situations in a previous work environment or how your input made a positive impact on a project or outcome. Don't be afraid to have those (brief) examples ready. A little self-promotion never hurts: Remember the "elevator speech" and the "sherlocking" previously mentioned? This is where you can show how a marriage of your strengths and the company's needs make a perfect match. If you are passionate about something that directly relates to the work the company does (or a charity it supports), don't be afraid to mention that and show how well you would mesh with the company's core values. Know what NOT to ask: Well, before we go any further, the worst thing to say is that you have no questions to ask your interviewer. OK? So with that in mind, here are a few to put on the "Don't Ask" list: Don't ask how long the interview will take, don't ask how quickly you will qualify for a raise or get promoted (answer: never! ), and don't ask "What does your company do?" What is the management style of your company? Will I work alone or collaborate with other people? What types of problems will I need to solve in this position? Take Paper and Pencil: If there is information you want to recall later, remember the cell phone rule and instead write down information with a small professional-looking notepad and pencil. Bring this with you so you give the impression you came prepared (and it's a great place to write questions to get answered). 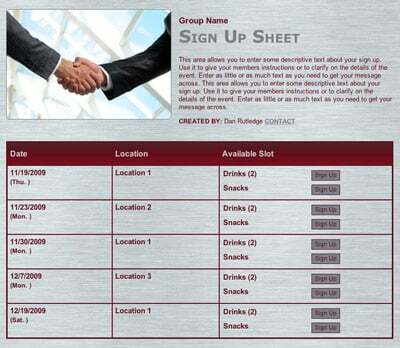 Reserve your office's conference room using an online sign up! SAMPLE. Don't turn a fender bender into a pile up: If the interview doesn't go as well as you had hoped, don't apologize profusely or seem overly distraught. A true professional leaves an interview by shaking hands, smiling and thanking the person for their time. You still may get a second shot despite what you perceive as a flubbed interview. Stay professional: You never know if your interviewer is right behind you as you leave so don't make any calls to share how it went, be rude to any office staff or throw a tantrum in the parking lot. Keep up your professionalism until you are off the premises. A follow-up is expected: As soon as you get home from the interview, write down as much as you can remember from the interview that can be used in a thank you letter and possibly future communication. If the atmosphere was casual, you may want to email a thank you right away. Or if the company seems more traditional, snail mail may be more appropriate for a hand-written thank you. You can't thank enough: Were there multiple people in the interview? It's not always obvious who the key players are in the hiring decisions, so thank everyone. Write down names in your notebook and you will have those handy for later. Don't be shy about mentioning something unique that was mentioned in the interview so you will stick out (in a good way) in their memory. Recognize the fine line between follow-up and desperation: It's wise to follow-up just enough to stay on their radar without coming off as panicked. Write thank yous on day one, craft an email a week later to see if there are any further steps needed, then either wait, or if you know the hiring period is over, send one more email to check on the status of the job. Sometimes the job-seeking journey will mean moving on, doing more interviews and practicing patience. In the meanwhile, don't give up. Remember to use the time to think outside the box about what you may be qualified to do, seek networking opportunities and keep refining those interview skills. Organize a blood drive with an online sign up!